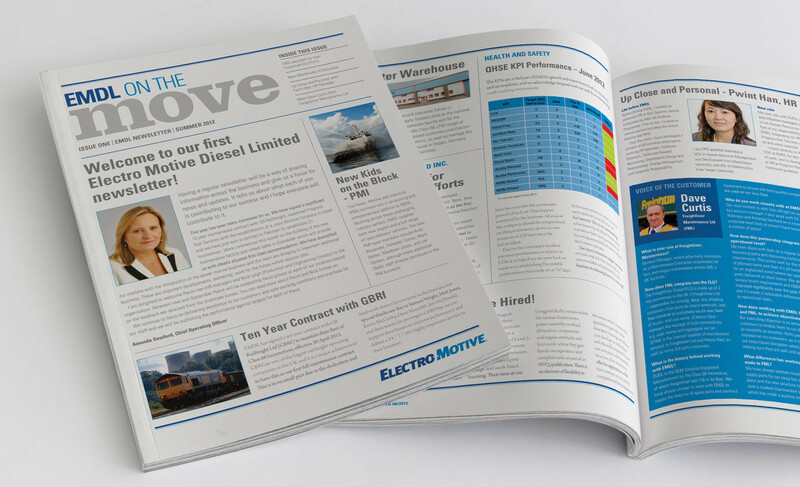 Working with our marketing partners at Laan Associates we developed an identity for EMDL, the UK arm of ElectroMotive Diesel. EMDL manufacture and maintain large diesel engines for rail, rail freight, marine, offshore and power industries. Building on the established US conceived brand, the feeling was that the elements for the UK and European markets needed a bit of localisation, especially in communcations with local clients and employees. TravisBead has worked on developing a seasonal customer and employee newsletter, to convey developments and news locally. The clean, flexible grid based design is adaptable to different content on a issue by issue basis. Following the success of these publications, the communications were continued with email marketing, advertising, brochureware and exhibition panels.